(CNN) -- English Football Association hierarchy promised a "transparent" World Cup bid on Monday when they launched the nation's attempt to host the 2018 finals. 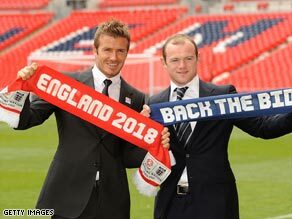 Superstars Beckham and Rooney were at Wembley to help launch England's bid for the 2018 World Cup finals. FA chairman Lord Triesman was joined by David Beckham, Wayne Rooney and Prime Minister Gordon Brown at Wembley with officials anxious not to repeat the mistakes that cost England the 2006 tournament. Bid chief executive Andy Anson believes the failed 2006 bid was guilty of "arrogance and complacency" and while Triesman stopped short of repeating the accusation, he feels the FA must learn from their mistakes. "We've got to go out and convince the rest of the world that we've earned the right," Triesman said. "There's no reason why people should give you things you've not earned and that's my whole approach to it. "People are very proud of their history and the FA itself is a 146-year-old organisation. I'm enormously proud of that. I'd be a liar if I didn't acknowledge it. "I think when you're very proud of something it's possible to talk to other people in a way that doesn't acknowledge that they're as proud of what they do. "I'm not describing that as arrogance, I think there needs to be a sensitivity to what other people feel and when you are sensitive to it they're enormously sensitive to what you feel." There have historically been question marks over the methods of gaining votes but Triesman insisted the bid will be executed professionally. "We will deal with people on a very straightforward basis and a transparent way," he said. "Everyone will be able to inspect everything we have done. "That is absolutely my intention and I will stick to that. That is what the rest of the world will expect from us. "I said from the outset, and I'm absolutely determined on this, that we will run a completely transparent campaign. "We are living in a world now where people are expected to be a bit more careful what they do in financial terms because of the world economic climate. These are much tougher times. "Displays of largesse are very unappealing. We will do it properly and spend the money we need, but we will do it properly." England, winners in 1966 when they last staged the event, are up against joint bids from Spain and Portugal plus the Netherlands and Belgium. Russia, Australia and the U.S. are also among those looking to host. Bids will be lodged in December with inspections from July to October next year before a decision is made at the end of 2010. Prime Minister Brown added: "There is one major issue that President Obama and I disagree fundamentally. He wants America to win the bid for 2018."